Almost all large enterprises use ERP systems for managing and optimizing enterprise-wide business processes. ERP systems like Oracle E-Business Suite are mission-critical for most enterprises and figure prominently in considerations for planning an enterprise cloud migration. Oracle EBS provides businesses of all sizes, across all industry verticals and regions with a global business foundation that increases productivity and reduces costs through a portfolio of rapid value solutions, integrated business processes, and industry-focused solutions. Oracle EBS has a three-tier architecture consisting of client, application, and database (DB) tiers. 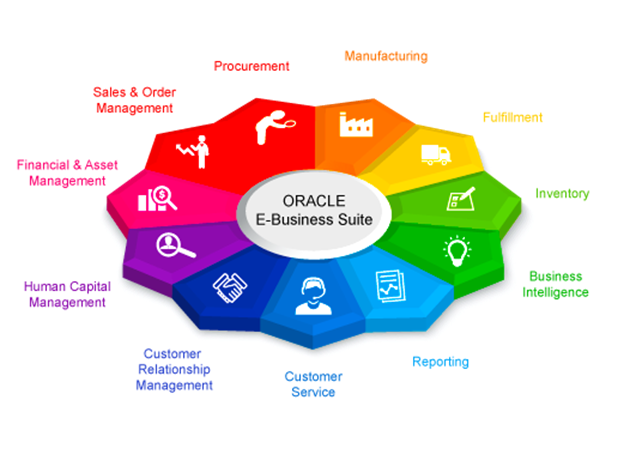 What does the Oracle E-Business Suite give you? Oracle EBS includes the company’s enterprise resource planning (ERP) product as well as supply chain management (SCM) and customer relationship management (CRM) applications. Each application is licensed separately enabling organizations to select the combination best suited for their business processes. The industry-specific solutions supplied by Oracle substantially reduce time and resources required in solution implementation and provide organizations with configured business processes that will improve overall effectiveness. Businesses can effectively and efficiently manage their supplier network from qualification to assessment and optimize their supply base and mitigate the risk with Supplier Lifecycle Management. With Oracle EBS you can increase the productivity and effectiveness of your business and also monitor and manage Oracle EBS system environments by combining both system management functions and change management from a single console with the Application Management Pack. Businesses can streamline their upgrade projects and improve business process effectiveness with advanced control solutions like Oracle Governance, Risk, and Compliance Management. Businesses can also achieve fast time-to-value by reducing deployment time and lowering overall total cost of ownership with the analytics seamlessly integrated to transaction systems. They deploy where there’s value, gain experience with Fusion applications, lower risk deployment, and minimize the impact on existing processes by implementing a co-existence strategy. Cloud adoption among enterprises is rapidly growing, with many adopting a cloud-first strategy for new projects and migrating their existing systems. Oracle promotes a co-existence or hybrid model that enables you to complement and augment your current Oracle E-Business Suite (EBS), by adopting Oracle’s cloud platform. Oracle Cloud ERP, formerly known as Fusion, is Oracle’s next-generation suite of business applications including human capital management, financial management, CRM, procurement, supply chain management, governance, and project portfolio management. In the past, running Oracle EBS on the Oracle technology stack on premises was the only choice for Oracle EBS customers. Oracle now has expanded the deployment model to include running Oracle EBS on the same Oracle technology stack but in Oracle Cloud. The cloud has become a central focus for Oracle, which already offers a comprehensive set of cloud solutions. The main reasons to move to a cloud computing environment are business agility, high efficiency, scalability along with significant cost reductions and support for business growth. However, many Oracle customers, including Oracle E-Business Suite customers, continue to run their applications on-premises or in a private cloud and have a significant stake in protecting this investment. Within the Oracle EBS ecosystem, customers and partners commonly maintain multiple EBS instances – sometimes isolated, sometimes integrated. The hybrid deployment model is gaining prominence because the same architecture, same standards, and same products are used to put Oracle technology stack in the cloud as are used to deploy it on premises. What this means that workloads can be migrated relatively easily between an on-premises instance and Oracle Cloud. Having the ability to run the same Oracle EBS applications on the same technology stack either on-premises or in Oracle Cloud, you can capitalize on the benefits of each deployment type by using the optimal model for each purpose. With a hybrid cloud solution for Oracle EBS, you can fine-tune how efficiency, agility, and innovation meet choice and control. Oracle E-Business Suite cloud deployments provide an array of benefits, both from an IT and a business perspective. The most significant benefits of cloud computing, as often touted in the marketplace, are support for growth, enhanced business agility, lower costs, and risk. When your business grows, the growth, in turn, drives the need to expand capacity for running your Oracle EBS footprint and the surrounding ecosystem. Business growth may require the addition of more users, new functionalities, new business processes, support for additional departments and expansion to new places or even countries. Running Oracle EBS on cloud enables you to subscribe to the surge capacity needed for new projects without bothering about data center space, capital purchases of new servers and storage, and additional system administration labor. Businesses can simply subscribe to the additional capacity needed, as and when required. Oracle’s EBS continues to deliver innovations via yearly release-wide updates until the next major release. An advantage of running Oracle EBS in Oracle Cloud is that businesses can stay current with the innovations in the application and more readily uptake new capabilities to support themselves, without waiting for the acquisition of new infrastructure for test and development environments. Businesses can discover and test new features and new products by quickly provisioning the latest Oracle EBS release from Oracle Cloud Marketplace and test the new features and new products on a cloned copy of Oracle EBS. They can streamline upgrades and leverage the cloud for Oracle EBS upgrades and updates. Oracle Cloud deployment provides an opportunity to lower your costs and risk in three ways. You can take advantage of the Oracle economies of scale. When you need to deploy new capacity, or you have obsolete equipment in your data center, one can take advantage of Oracle’s ability to economically scale up capacity which costs less than maintaining your data center and working at the scale of an individual company. The second way you can save money is through a cost-effective system management. The Managed Cloud Services (OMCS) group can manage and run the system at a very competitive price. Deployment on Oracle Cloud is about reducing the operational risk related issues. If your system is run and managed by people whose expertise is running and managing Oracle EBS and hence the likelihood of error is much lower than it is if your staff has to undergo the same learning curve just for your business. So, staff could be focusing on core business competencies while letting Oracle deliver the technical expertise. A cloud subscription plan with a surge capacity is a cost-effective choice, allowing you to both tailor resources to your existing workload and to accommodate any growth requirements you may have. Fundamentally, cloud deployment helps you to lower costs and accelerate development, testing, and training. The need to maintain your hardware and infrastructure is not there anymore, and you have instant access to the latest products and features. A true advantage indeed.